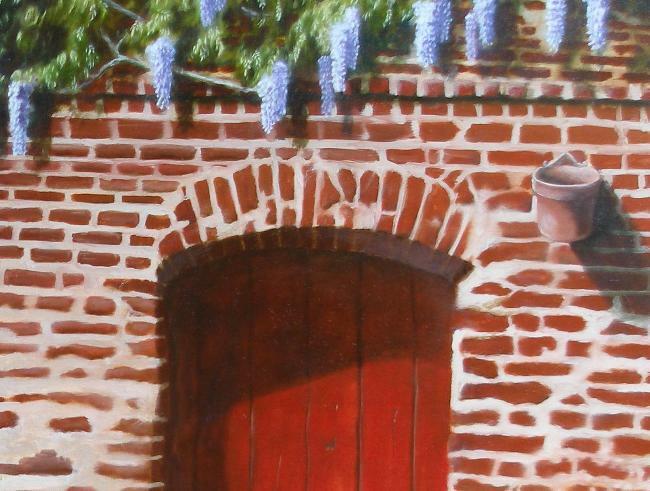 Tuscany painting with red door entrance, begonia's and wisteria. 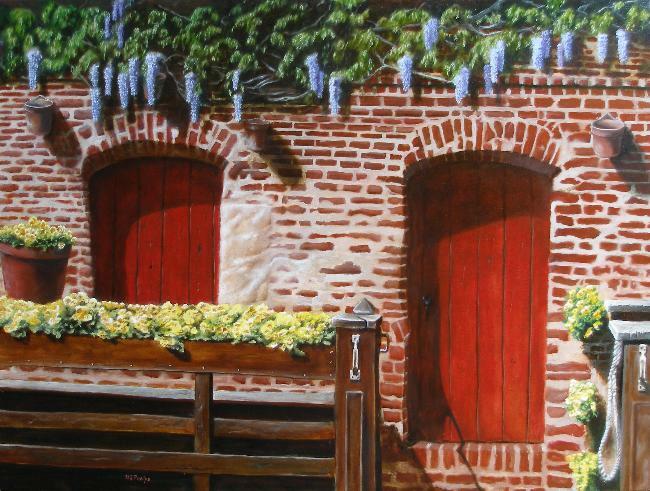 Tuscany painting, an entrance way with red doors and shutters, yellow begonia's and wisteria. 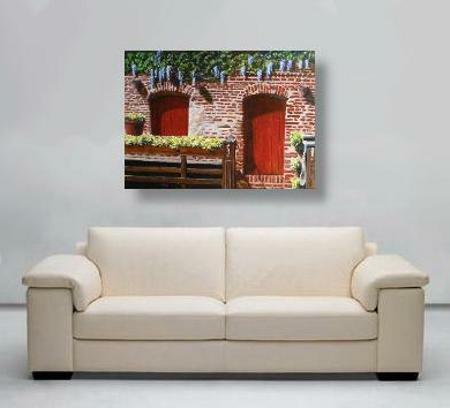 Home > Main Gallery Page > Begonia Welcome, a tuscany painting. So many things to view, this Tuscany painting will brighten any room it adorns. This painting was created using multiple reference photos. Some of Tuscany courtyards, some local begonia displays and wisteria hanging in various places. Combined, they seem to pull it off well together. It's one of the few cityscape paintings I do, so here's your chance to own one! 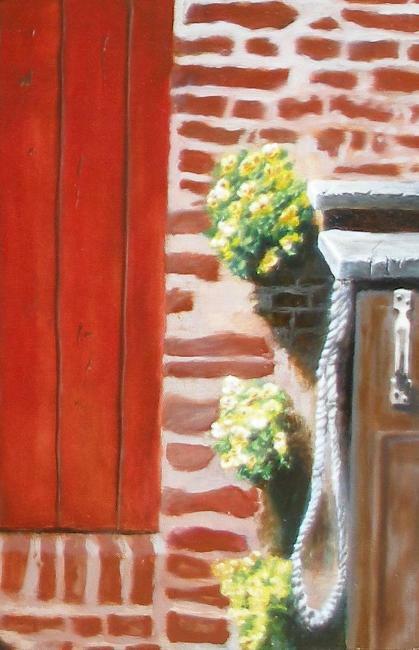 One of the things I really enjoy about this painting is the brick work. Not like modern, everything has to be perfect, buildings. These are from years and years of wear, renovations, weather damage, and who knows what else. The other thing that so intrigued me were the wisteria. The grapes like clusters hanging from the vines and the overhead canopy of foliage that brings both shade and wildlife is such a treat to see and experience. I can imagine when I'm old and gray headed, sitting with my love and a glass of Cabernet Sauvignon in this courtyard discussing the day's plans, breathing the fresh Tuscan air as the sun creeps into the yard to take the chill off the air. Sorry, I'm getting carried away. It's something my wife enjoys doing too, viewing a cityscape or landscape and letting your imagination put yourself into the picture and thinking about what it would be like. It is a huge 30" X 40" canvas (gallery wrapped and ready to hang). Appropriately named "Begonia Welcome", the display of yellow begonias is beckoning you in for a visit to the hidden courtyard. The well worn rails and post tops show of many such visits. Hopefully you will join us for a glass of red wine, cheese and bread for a noon time lunch. Just knock and come on in past the red door! "Begonia Welcome" will brighten your home for many years to come. Go ahead and start your collection with this piece! See below for more details on this Tuscany painting. Size: 30" X 40" oils on gallery wrapped canvas, no framing needed. See the Etsy page for details on shipping, pricing and availability. 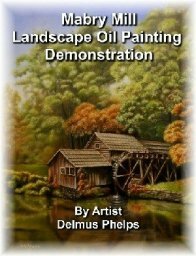 Click here for additional info on my painting process, and guarantee when buying paintings from the internet. Order your painting from here! 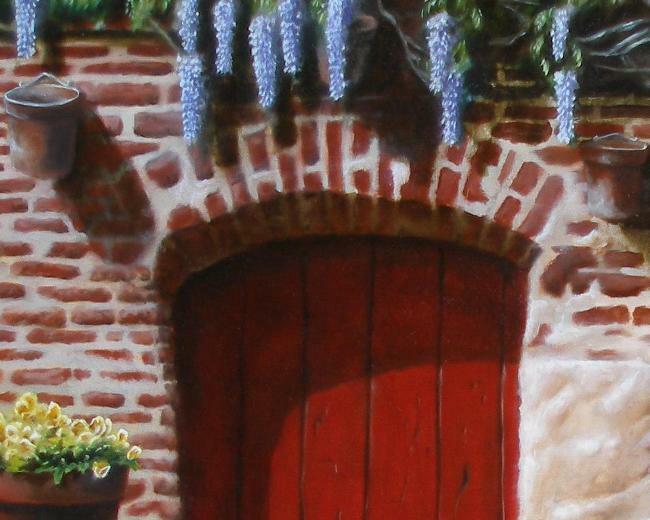 Leave this tuscany painting page and head back to the Main Gallery.